Vamana is the fifth incarnation of Lord Vishnu who appeared in short appearance to rescue heavens from Mahabali, a great Asura king. It is believed that anyone who worships Vamana can lead a healthy, wealthy and successful life. Vamana homam will result in several benefits for gaining better prospects. This homam is mainly meant for receiving blessings from Supreme God Vishnu to eliminate various types of problems. In fact, it plays a key role in protecting a person from enemies and evil forces to a wider extent. According to ancient Vedic texts, Vamana avatar gives the message that one should not underestimate others based on their appearance. 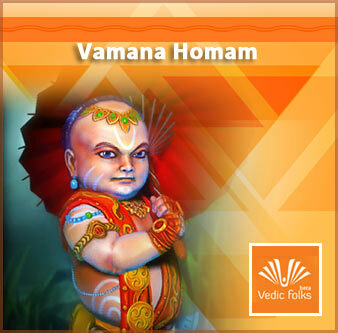 Vamana homam is a suitable one for avoiding unnecessary worries and removing obstacles in life. Anyone who wants to get relief from sins in past and present life can select this homam for experiencing peace of mind. Furthermore, it is possible to improve spiritual knowledge and wisdom with Vamana homam by meeting exact requirements. Vamana homam makes feasible ways for overcoming potential threats and risks from ill forces to live a safer life. Karmic issues and dosha problems can be removed with this homam to obtain more prosperity. In addition, one can be able to control the malefic effects of planets in a horoscope after choosing the homam. Also, this homam helps to increase learning skills to reach high levels both in career and life. Vedic folks is a leading Vedic firm which delivers valuable services while organizing Vamana homam. Expert priests and pundits will provide ideas for conducting it with powerful mantras and fire rituals. One can also perform this homam at the right time after analyzing the birth chart in a horoscope. Online support is offered for those who want to book the homam in advance. The homam includes live TV shows for watching it from anywhere in the world.